We are thrilled to unveil The Complete Häfele: Furniture Fittings Design. The latest edition to our literature library showcases our entire product range for furniture buyers, designers and manufacturers. With over 6000 products, The Complete Häfele Furniture Fittings Design is a comprehensive reference for reader’s active end-to-end in the furniture industry across residential, commercial and leisure spectrums. The guide features new products from market leading suppliers such as Grass and Smeg, alongside extensions to Häfele’s existing product detail including the Wirework range of kitchen storage solutions. The latest edition of our ‘ What’s New’ brochure brings you all the latest additions to the Häfele product range, as well as the release-dates for products coming soon. The brochure also contains exclusive product updates across our Häfele wirework range and from premium movement specialists, Grass. A ‘What’s New’ brochure is available with every copy of the Furniture Fittings Design TCH. 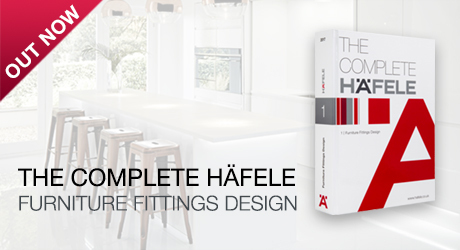 You can view our products in our online catalogue or purchase a hardback printed copy of The Complete Häfele: Furniture Fittings Design here.